NYC, 04/17/2019, 5:00PM. 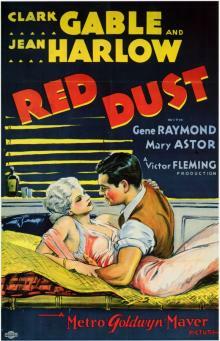 Red Dust (1932): Romantic Drama With Clark Gable. The owner of a rubber plantation becomes involved with the new wife of one of his employees. 83 min. Director: Victor Fleming. Starring Jean Harlow, Clark Gable, Gene Raymond. In 2006, Red Dust was selected for preservation in the United States National Film Registry by the Library of Congress as being "culturally, historically, or aesthetically significant". The film is based on the 1928 play of the same name by Wilson Collison.